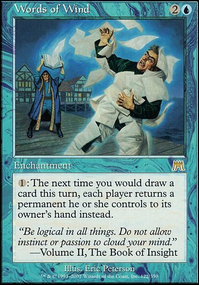 Does reducing a card's cost alter it's CMC? What is mana cost X when I have cards that reduce colourless costs by an amount? 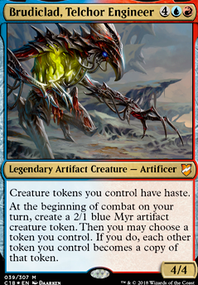 Why did you go with Foundry Inspector over Etherium Sculptor ? It's 1 less CMC and you get the same benefits. 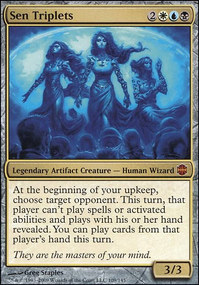 What are your thoughts about Treasure Mage to fetch Wurmcoil, Combustible, Scuttling, or Duplicant? Have you thought about Grand Architect ? It's a little wonky but you can get a lot of value from it. I am wondering if you think there's better alternatives or possibly you don't run it because it's not an artifact? Thanks for taking the time to look through this deck! I had Tetsuko Umezawa, Fugitive thrown in at first because of how much I struggle with getting creatures out at the start of the game. I found this to be because I didn't have enough mana/get enough mana at the start, so I would always get squashed. I am planning on swapping that one out when my new cards come in. I also just purchased Deeproot Waters ! I tried to include a lot of card draw because of my commander, who gives me unlimited hand size (and hand size reflects her power and toughness). I have a few more cards coming in that should help with that! I will have to investigate Benthicore , thank you for the suggestion! I like that I could tap two low hitters and get a 5/5 to hit with instead. I also appreciate the feedback you gave on cards that would work with my commander, like Library of Leng and Reliquary Tower . The Venser's Journal you suggested seems like it would work well in my other deck, too! I just added Spellbook and Venser's Journal to my checkout list! My partner has a copy of Thought Vessel he is willing to give me. 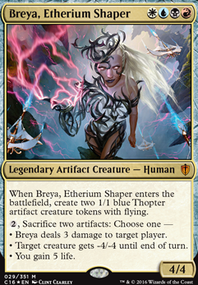 I am going to remove Etherium Sculptor and Padeem, Consul of Innovation because I don't have many artifacts. I really, really appreciate the time you took to not only reply to what I've got going on, but by also looking through my cards and considering what would make the deck better and by suggesting cards that would improve upon it! It did not come across as rude in the slightest. I value your feedback and can't wait to improve my deck! Not the dracogenius. Almost all of this deck was put together from what I first started off as for a jumping point, then I used cards from several other decks online and youtube videos to improve it. I think it has a ton of fine tuning and some testing, but once I get the rest of the maybe board purchased I will start shifting things around and playing around with it more. Past in Flames looks good. Never even considered that. So I will consider that later on. 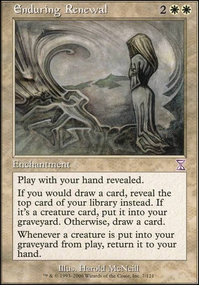 I did have the parun in my deck, but I swapped him out for something I deemed much better for now which was the Etherium Sculptor for another infinite combo. SevSeventeen, I forgot to mention Voltaic Key and Etherium Sculptor . 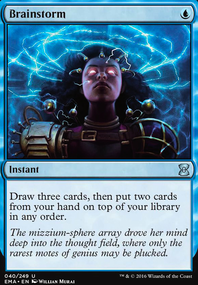 I included Voltaic Key because it can act as a quasi mana-rock and is simply a better option for one of the 99 than a 0cmc that does nothing but, cantrip if Jhoira is in play. 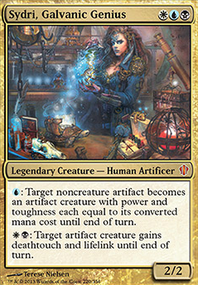 I included Sculptor because he adds another way to draw the deck with Sensei's Divining Top , he's an artifact and he's 2cmc which means, he can be tutored with 4 of the deck's tutors and if he's in play with Helm of Awakening then all the 2cmc artifacts are free to cast! Also, unlike Helm, he only reduces spells I control. hungry000 on Fast mana in modern? 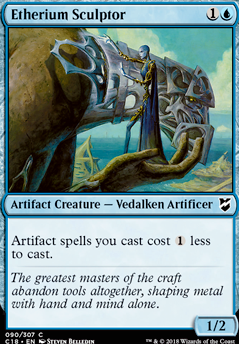 They don't count as fast mana, but cost reducers like Foundry Inspector , Etherium Sculptor , and Chief Engineer can help if you want to spam artifacts. If you're playing any blue creatures, Grand Architect is pretty good, though it comes down a little later than what you want.